Leading Manufacturer of friction hinges for doors from Dombivli. We are one of the widely acclaimed manufacturers and suppliers of Friction Hinges for Doors. The offered friction hinge is highly acclaimed and appreciated by the clients, owing to the unmatched load bear ability and durability. 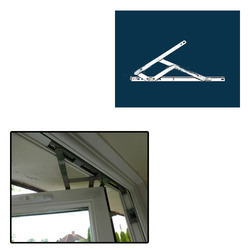 Our supplied friction hinge facilitates the full opening of windows. The offered friction hinge is available at very affordable market selling rates. Looking for Friction Hinges for Doors ?